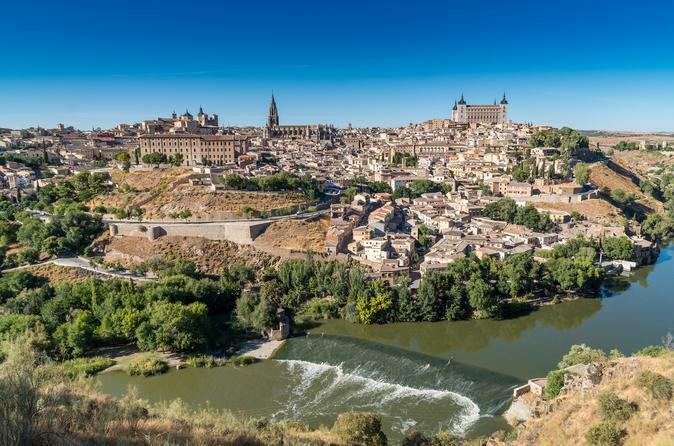 Enjoy this whole day pack visiting Toledo in the morning and afternoon in Segovia. Toledo tour starts from our offices located in Calle Ferraz 3. After approximately one hour journey, the activity begins with a walking tour through the historic center of the city. Considered a National Monument and declared a World Heritage Site by UNESCO. Toledo has magnificent examples of architecture from different eras and styles: Mudejar, Romanesque, Gothic, Renaissance, Baroque ... that left as a legacy the different cultures and civilizations that coexisted within its walls. All accompanied of our expert local guide to discover these and other details of this wonderful destination. Then we’ll continue to Segovia, visit the Plaza del Acueducto, Town Hall Square, the exterior of the Gothic Cathedral and of course the interior of the Alcázar of the 12th century, former fortified residence of the kings of Castile, plus a walk on foot through the city, all accompanied by our expert guide. Upon our arrival in Madrid, the activity ends at Plaza España with Gran Vía.